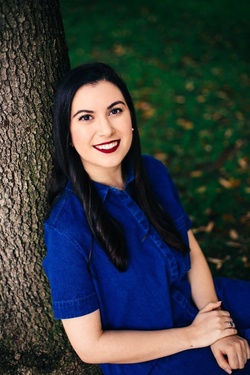 Neusha Khaleghi, a Stephen F. Austin State University psychology graduate student, received a $1,500 grant from Psi Chi, the international honors society in psychology, to help fund her graduate research project, "Weight-based Stigma, Self-efficacy of Dietary Control and Cortisol Levels in College Women." NACOGDOCHES, Texas - Stephen F. Austin State University psychology graduate student Neusha Khaleghi received a $1,500 grant from Psi Chi, the international honors society in psychology, to help fund her graduate research project, "Weight-based Stigma, Self-efficacy of Dietary Control and Cortisol Levels in College Women." Khaleghi is studying whether or not there is a correlation between levels of cortisol, which is a steroid hormone that regulates processes throughout the body such as metabolism, and self-efficacy of dietary control in college women who are judged for their weight. "Basically, we want to see if women who perceive themselves as overweight have higher levels of cortisol when they are stigmatized due to their weight." The Psi Chi grant will allow Khaleghi to purchase equipment that will help collect and analyze saliva samples in order to measure cortisol levels in participants. In addition to her primary research, Khaleghi also is interested in determining whether stigmatized women will consume more high-calorie foods than participants who are not stigmatized. For more information on SFA graduate research, visit http://www2.sfasu.edu/orsp/index.html.